Learning English can be great fun. But yes — it can also be annoying. Sometimes the rules don’t make any sense. Sometimes you learn a phrase, then discover that there’s a better way to say that phrase. For me, the most annoying part of learning a language is when I learn something … and forget it immediately. “The best way to solve this?” you ask me. One of the best ways of solving this is by testing yourself. Testing yourself forces you to really think about what you’ve learnt. As a result, you internalise it more. 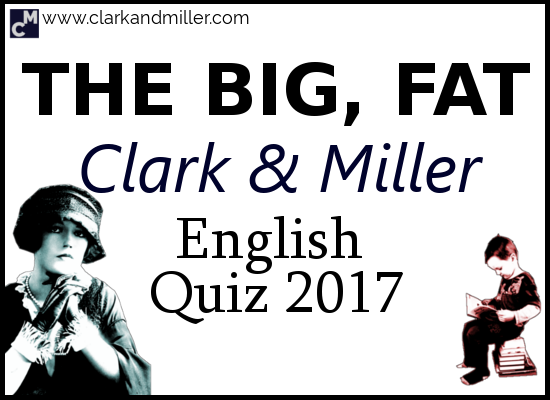 The Big, Fat Clark and Miller English Quiz 2017! If you get a question wrong, click on the link that appears next to it to go to a free lesson on that topic. Good luck! Well done! You’ve made it to the end. Was there anything you felt a little confused by? Ask me in the comments. I love helping! Did you find this useful? Do you know any people (or llamas) that might also benefit from this? Then BE AWESOME AND SHARE! Spread the knowledge! I’m really enjoyed to improve my vocabulary in this way. Especially with lots of hints when you click a wrong answer. This is one of my favourite websites where I can improve my skills. Thanks Patricia. And nice one for keeping up working on your English! Thank you very much. It was nice. Thanks Nadia. And good work for testing your English! Thank you 😀 ,now I have more than 15 articles to read! Haha! Well, it’s great to see that you’re taking charge of your learning. Well done! I got confused with the last one but it´s OK. Thank you so much, Clark. It was fun!!! Cheers Gabriela! It’s great that you found it useful. Haha! I like your style, Michelle.